Oh Barney how you have been a constant in my life, since my baby sitting days in junior high school to my own children today. Quite honestly my favorite part about Barney are the songs as they are easy to sing and remember and this DVD is all about the music! Riff's Musical Zoo - Everyone is excited about an upcoming trip to the zoo. When the trip is postponed, Riff gathers instruments that sound like real animals and creates a musical zoo using everyday items around the playground. This is our favorite episode on the DVD and it really gave Connor the idea that things can sound like other "things". I love the creativity. Special Skills - Barney suggests that BJ and Baby Bop put on a show so Riff can see how much fun they have in the park. Riff is a little shy - he's never performed in a show before. Barney encourages Riff to participate, and Riff does what he knows best - he makes music to accompany a very special puppet show. Rhythm - Baby Bop is practicing her marching because she will be joining a real marching rhythm band and is having trouble keeping a beat. Barney, BJ and Riff help Baby Bop learn about rythem just in time for her to join the band. A dvd game all about animal sounds and a bonus episode called Timmy Time. You know really my only complaint about this dvd is its a little short. Only 40 minutes, I would have really preferred it to be six episodes, but it's the perfect length for a good wind down video before nap time or during snack time. Connor really enjoyed the episodes about music and danced through many of the parts. He's been looking for items around the house that sound like animals, like how squeaky door frames sound a little like a cheeping mouse. 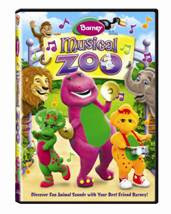 You can buy your own copy of Barney Musical Zoo on dvd and pick up a copy on Amazon . Disclosure: We were given a copy of Barney Musical Zoo free of charge, we were not compensated for this post in any other way. My opinions and comments on items we review are always my own and are never influenced by sponsors.